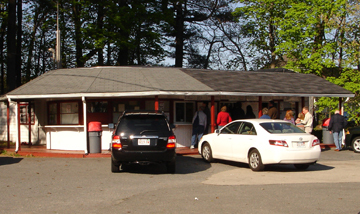 Hodgie’s Ice Cream has been serving award winning homemade ice cream and cooked to order grill food since 1984. Our frozen dessert menu has something for everyone. It includes over 40 flavors of premium ice cream, various sherbet flavors, No Sugar Added ice cream, dairy free sorbet, and hard serve yogurt. We also carry soft serve ice cream and soft serve yogurt. Our food menu includes 100% Black Angus hamburgers, hot dogs, chicken fingers, grilled chicken sandwiches, lobster rolls,and homemade chicken salad. All our food is cooked to order. We have a beautiful picnic area under the cover of pine trees where you can enjoy your summer treats! Take Exit 58B to Amesbury. Merge onto Rte 110 West. Follow for 2.7 miles through 4 sets of lights and we are on the right. Take Exit 58B to Amesbury. Take a left onto Rte 110 West. Follow for 2.7 miles through 4 sets of lights and we are on the right. Take Exit 54 Rte 150/Amesbury. At the end of the ramp bear right onto Rte 150. Just before 1st set of lights, take a left onto Rte 110 West towards Merrimac. We are 0.5 miles down on the right.